So remote, they are steeped in legends of snow yetis and mysterious monsters devouring all who dare to venture into these remote areas. With strange occurrences such as that of the Dyatlov Pass, which have supported such fears for many years. Maybe even as old as the great sphinx. More and more is being learnt about them, with ever more daring explorations of the ruins being undertaken, a team discovered a vault in one of the stone megaliths, an access fault that led them into an artificially made stone cavern systems. The first where to start this journey Vottovaara Mountain – the highest point of the West Karelian Upland – 417.3 m above sea level. Mountain area of 6 square meters. km. The place is just full of strange artifacts after which you start to think about ancient advanced technologies for stone processing, let’s look at the photo. Mountain Vottovaara. Megaliths scattered blocks. Middle block cut down at an angle of 90 degrees or a freak of nature? As if the laser spent 🙂 geologists believe that the cracks and fissures are formed by a powerful earthquake around 9000 years ago. Smooth stones same plane – the result of the local properties of the rock – quartzite, whose structure and defines a flat plane as the split. So all the same nature or man-made? Let’s take a closer look. More like a perfectly sawed blocks podognanye tightly to each other. It is hard to imagine the ancient ancestor with a copper chisel which is somewhere on Mount grinds such smooth blocks. Good view, perfectly smooth wall. Mountain Pidan. At first glance it looks like an unremarkable pile of stones cracked rock. But coming closer it becomes more like a megalithic masonry. Peering between the blocks, where the stones were less susceptible to erosion from wind and rain can be seen as the man-made and kept straight faces. In a place where the joint units sold can be seen even saw cut, and before us the technology of stacking these blocks. Stone Town in the Perm region. According to scientists, Stone Town – is the mouth of the river, a tributary of millions of years ago in the Permian Sea this explains beautifully and smoothly, at right angles, carved stones, masonry and trim them perpendicular to each other “channels”, “mouth”. See how smooth side of megaliths as if cut down. Again the old method to look into the masonry between the blocks, looking at the long-range block in the center, clean cut across the length of the block. Say somewhere on the Kola Peninsula is the swimming pool carved into the rock. In the south of Western Siberia in the mountain Shoria in Mezhdurechensk area there is a small village called Geological Stones. In this village lives a few educated talented geologists. This Alexander Bespalov, Vyacheslav Pochotkin and others. These people all his life engaged in research of mountain systems in Western Siberia. One day they came across in the mountains of strange megalithic constructions that for themselves they could not explain. These were the walls, lined with giant stone blocks and a strange construction with vertically mounted stone obelisk. On the Internet, they contacted George Sidorov, since the first expedition was assembled. Mountain Shoria. Some granite blocks stacked below were red granite, crowned their gray blocks of granite, as above lying polygonal masonry of various blocks as red granite and gray. Wall composed of polygonal masonry blocks of different color. Block sizes are impressive, according to one version, a find – a man-made structure of the age of more than 100 thousand years. In the photo Georgy Sidorov, in his opinion all this megalithic structure may be the ruins of an ancient power which translates seismic energy in any other. Again looking inside masonry where the blocks were less prone to erosion, seen flat straight edge, watching as the two units are tight, man-made, is better visible. Mountain Shoria. Huge blocks at the Department of Radio Physics at Tomsk State University showed pictures on the screen, telling about the different types of masonry, stone of the castle, which secured the giant granite blocks and no scientist physicist, said that all this is of natural origin. Most of them were surprised, as they could raise the ancient giant blocks of stone to a height of over 1,000 meters and there to set them on a special platform. Then the Tomsk branch of the Russian Geographical Society, scientists have studied photos of geologists and geographers. And they both came to the conclusion that the presented artifacts are handmade. Sklyarov was asked to comment on the find. And what did he say? That all artifacts found nothing but a cracked rock at right angles. That there is nothing man-made here. Just a freak of nature, nothing more. After these words, I do not wonder why Laia does not study Russian megaliths. Shaman Mountain near with. Nizhneleninskoye, Khabarovsk Territory. Again, the best man-made visible between the blocks and straight lines. A large block of megalith. A large block of megalith on small stones, so make for better seismic resistance. Megalithic masonry reminiscent Mountain Shoria. Kabardino-Balkaria, a cave in the Baksan Gorge. First it is necessary to squeeze into the size of 40 by 120 cm hole, and then down on the rope on the narrow vertical shaft. Its form, two parallel flagstones. At 9 meters – the first “knee”: hole goes away and immediately breaks down again. Already here you will cover the absolute silence – the outside does not get any sound. 23 more meters in depth – and a new “tribe”. To reach the bottom of the cave, it is necessary to overcome more than 80 meters, and it will take an hour. But, having passed the “bottleneck”, you will find yourself in a huge room, which the researchers called “jar”. Inside, we see the treated wall of tufa and granite, composed of different-sized, closely matched to each other polished megaliths. Clearly visible faces of blocks and the seams between them. Smooth clutch hits and stone seams, well adjusted to each other. Barely visible seams blocks on the left wall and crescent on the wall behind her. Rotate the cave at an angle of 90 degrees. Two large megalithic blocks are on each other. “Tuff is a cluster of volcanic emissions products – ash, bits of lava , volcanic glass and, to a small extent, debris that form crater wall. release material when the accumulation was hot and so the solidification cracks were formed separately – that is the whole array of tufa appeared as if broken into blocks. 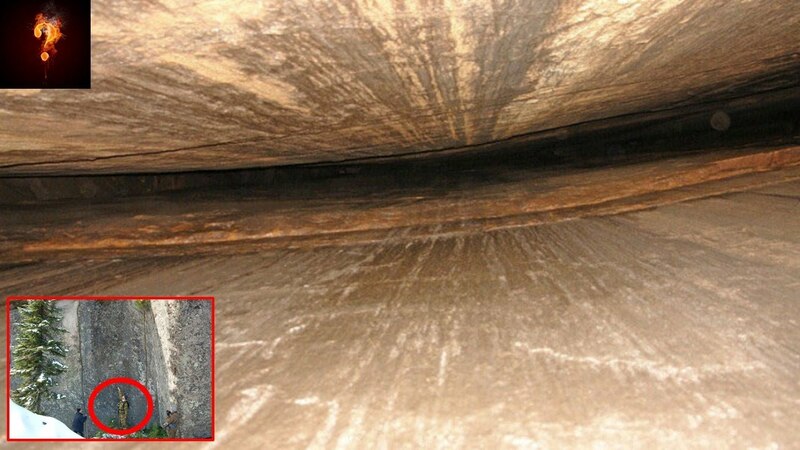 Deepening discovered near the village of Zayukovo, is one of these cracks gravity separation, which is characterized by smooth contact surface”.